San Diego, CA – The University of San Diego (USD) and the Franciscan School of Theology (FST) announced today that the FST campus, currently located on the grounds at Mission San Luis Rey in Oceanside, CA, will be relocating to the USD campus in San Diego in the summer of 2019. FST is the only freestanding, graduate-level school of Franciscan theology in the English-speaking world transmitting the rich heritage of Catholic theology flowing from the spiritual, social and ethical teachings of St. Francis of Assisi and developed by Franciscan theologians such as St. Bonaventure and Blessed John Duns Scotus. In 2013, USD and FST entered into an affiliation agreement to expand USD and FST graduate student opportunities across the breadth of their respective graduate curricular offerings and advance their respective missions in the Catholic intellectual tradition. Through the affiliation, FST graduate students can enroll in selected and approved USD graduate courses offered through the School of Leadership and Education Sciences, the Joan B. Kroc School of Peace Studies, the School of Business MBA program, and in certain undergraduate courses in the USD department of philosophy. These courses enhance the capabilities of FST graduate students to serve in stewardship roles in the Catholic Church and other mission-oriented institutions. Likewise, USD students may complement their graduate education with select coursework in theological studies through FST. With FST’s Oceanside campus moving to the USD campus, FST and USD graduate students will have more convenient access to both USD and FST courses that complement graduate degree programs. The affiliation and integrated location also provides new opportunities for USD and FST faculty and students to collaborate in service, research and other scholarly activities. FST temporary facilities at USD will be located adjacent to the St. Francis Center for Priestly Formation. The Franciscan School of Theology offers graduate degrees in theology (Master of Divinity, Master of Theological Studies and Master of Arts) for men and women, lay and religious, preparing for many different forms of ministry in the Catholic Church today. For more information about our graduate programs, contact our Department of Admissions: Gigi Betancourt (760) 547-1800 ext. 204; Christine Avella (760) 547-1800 ext. 226; Office of Admissions Fax: (760) 547-1807. 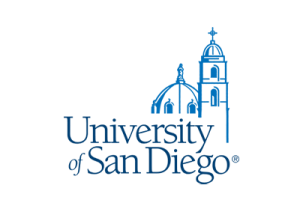 The University of San Diego sets the standard for an engaged, contemporary Catholic university where innovative Changemakers confront humanity’s urgent challenges. With more than 9,000 students from 85 countries and 50 states, USD is the youngest independent institution on the U.S. News & World Report list of top 100 universities in the United States. USD’s eight academic divisions include the College of Arts and Sciences, the School of Business, the Shiley-Marcos School of Engineering, the School of Law, the School of Leadership and Education Sciences, the Hahn School of Nursing and Health Science, the Joan B. Kroc School of Peace Studies, and the division of Professional and Continuing Education. USD’s Envisioning 2024 strategic plan capitalizes on the university’s recent success in completing its $317 million Leading Change campaign and aligns new strategic goals with current strengths to help shape a vision for the future as the university looks ahead to its 75th anniversary in the year 2024.